Back in 1997, I was scouting for a property to buy as I considered one day retiring in Miagao, a coastal town in the province of Iloilo that extends from the shores of Sulu Sea up to the mountains bordering the province of Antique. Referred by an agent, I climbed down the embankment of the National Highway to a swampy land beside Sapa creek. The property had a virtually abandoned old bakery building, a few small wooden dilapidated buildings surrounded by a ‘forest’ of huge banana trees. Even the caretaker was hesitant to show us around and mostly trying to talk me out of the idea of buying the place. I remembered he said that the place was enchanted, with a ‘white lady’ that prowl the old building at night, a balete tree that was home to dwarves, the big talisay trees that hosts kapre, tikbalang and other enchanted beings. The bridge was not totally unknown to townsfolks. They just did not care much about it because of stories of the bridge being haunted by the many who died by accidents and other mishaps on the bridge; and of the passage along the Sapa creek on misty nights of an enchanted golden ship carrying the mythical Princess Ulayra. Looking through the banana trees towards the creek I spotted the Roman Arch of a bridge, almost totally covered by moss, shrubs and trees. I thought it was an odd structure, considering that the modern National Highway was on top of the bridge. I asked the caretaker about the name of the bridge and was told that it used to be called Sapa Bridge, but renamed later as Britanico Bridge in honor of former Congressman Salvador (Buddy) Britanico. I looked at the bridge closely and instinctively decided to buy the property. I later named it Sulu Garden, despite the ‘white lady’ and the other mythical creatures of the night! I left Miagao in 1999 neither seeing a ‘white lady.’ nor a golden boat. I lived in New York City for more than a decade and finally returned to Miagao in 2012. After a 13-year sojourn, I was still obsessed with that bridge and finally began clearing the bushes, trees, moss and garbage strewn at the bottom creek. Cleaned up, it turned out to be much grander than I thought back in 1997. And stronger than I thought, being able to hold tons of traffic on the highway built over it in 1979.
utilitarian ones. 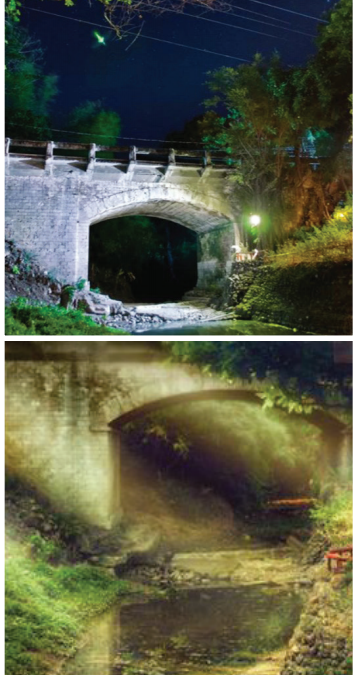 There were two visits by engineers from the Department of Public Works and Highways (DPWH) between 2013 and 2014 to assess the condition of Puente de Britanico. Each time, they certified the stone bridge to be strong and not subject for replacement or re-strengthening. That was a relief ! I did not want the bridge touched. On both occasions, the government bridge engineers showed me the ledger indicating the bridge was built during the American Occupation Period, an era representing the decades after the Philippine-American War that started in 1899. But, after months of reading literature on American built bridges around the world post-1899, there was nothing to show that this bridge architecture is similar to American built bridges. The type of bridges Americans built by the turn of the century was made of steel and cement; sturdy, utilitarian and simpler in design. Perhaps, the base of the bridge, which seemed eroded and of different materials than the upper part of the bridge, was repaired due to flood damage during the American Occupation Period and thus entered as American in the DPWH ledger. Just one more of the many unanswered questions about this bridge to be solved later on. In June 2014, I happened to be re-reading “History of Miagao,” a historical account about Miagao published in 1979 by Elias N. Failagao, a local Miagaowanon. And there it was! A page with a chronology of major events in Miagao, including a line… “1873, construction of stone bridges at Sapa Idot, Mambatad, Malihothot, Damilisan and Narat-an.” Two other bridges were built the following year in Tabunacan and Lanutan. Besides the stone bridge of Sapa, all the other Spanish built bridges were long gone. Then, the boyhood memories came back of the time my friends and I were navigating Imus River on a bamboo raft. Passing under the Puente de Isabel II, I remembered the arches under the bridge. It was the same design; almost similar patterns! I thought that maybe this is a Spanish bridge after all. I started reading all I can find about Spanish bridges since finding that entry in Failagao’s book. And, reading the pages of Prof. del Castillo-Noche’s book on colonial bridges finally convinced me that Puente de Britanico is indeed a Spanish and not an American bridge. I wrote the National Historical Commission for assistance to confirm the nature of the bridge architecture and still waiting for an answer. The bridge is cleaned of debris. The white stones, quarried most likely from the mountains of San Joaquin, are resplendent after many weeks of careful manual cleaning with fine wire brush. Flowering plants are beginning to bloom from seeds planted months ago. Sapa creek is much cleaner than it used to be in the 1990’s and cleaned everyday of debris and plastic garbage. People since stopped throwing garbage over the bridge (some needed a bit more forceful convincing). The banks of the creek are planted with more flowering plants, papyrus and miagos bushes. Birds, butterflies and monitor lizards can be found roaming along the edge of the creek. Wildlife is coming back. Sulu Garden, a nature center built besides the bridge, provides a convenient access to see Puente de Britanico in all its glory. Here, tourists visiting Miagao Fortress Church, a UNESCO Heritage Church, gets a chance to see the other attraction in Miagao, perhaps the only remaining fully intact Spanish bridge architecture in the island of Panay. One day Puente de Britanico will get its municipal landmark recognition and perhaps the National Historical Commission will finally make it a national heritage site. For me there is still one more challenge – find the keystone marker. Every builder leaves a mark carved in stone. Finding it will once and for all confirm the date of the bridge and the unnamed engineers who built it.